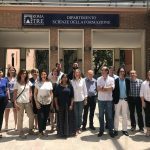 The second transnational partner meeting in the Open Virtual Mobility Erasmus+ strategic partnership took place in Rome at our partner organisation Università Roma Tre from 30 May 2018 to 01 June 2018. Our second meeting took place shortly after we have successfully completed Quality Gate 1, moving from Cycle 1: Foundations & Concepts to Cycle 2: Requirements & Prototypes beginning in June 2018. The meeting was dedicated to sharing and discussing the results in all of our seven outputs and planning Cycle 2 which will end in February 2019. First, we started with the common understanding of the Open Virtual Mobility Framework. The conceptualisation of VM is conceptualised on a continuum from a informal virtual mobility to formalised virtual mobility. The EADTU Matrix, which was just just recently published by our partner organisation, proposes some key criteria for Virtual Mobility and Open Virtual Mobility. The partners have emphasised that VM is not only formalised but there are also VM forms without institutional agreement. We all agreed that quality evaluation is important for type of VM. We have also discussed the results from the Group Concept Mapping study conducted by our partner organisation OU NL Welten Institute which has enabled to identify key VM skill clusters, i. e. intercultural openness, digital skills and self-regulated learning. We will now be working on linking the results from Output 1 to the existing competency frameworks in Europe, so that VM skill sets can be used for the development of e-assessment in Output 5 and digital, open credentials in Output 6. Second, we discussed e-assessment, open credentials and gamification in the VM Learning Hub. We are working on e-assessment of VM skills in Output 4. Three kinds of assessment and tools will be used in the VM Learning Hub: diagnostic, formative, summative assessment. The discussion revolved around how to implement the self evaluation tool and evidence from learners. Especially for e-assessment based on learner evidence which will be stored online, it will be important to develop criteria to assess the quality of evidence provided by learners in the VM Learning Hub. We have also developed an idea on how to use color to highlight different e-assessment types. Open credentials are developed in Output 5 by Beuth University of Applied Sciences together with CINECA. 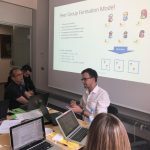 We discussed the results of consultations with Blockcers experts and decided to focus on Open Badges as the form of open credentialing in the VM Learning Hub. 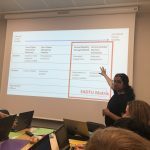 We have developed a template for designing open badges which we be hosted at the Bestr platform of our partner organisation CINECA. Furthermore, we are working on gamification in Output 5. Our approach is meaningful gamification and we already have interesting results from the requirement analysis. Based on the results, project partners will now be evaluating the feasibility of meaningful gamification features shortlisted for the final analysis. Third, we have talked about the current state of the VM Learning Hub. The VM Learning Hub is up and running on the server of our partner organisation Politehnica University of Timisoara. At the current stage it is only available to project partners, as we are still working on the structure, the integration of different services and first content. Fourth, we have made some decisions about the competency directory and learning group formation. Beuth University of Applied Sciences is developing semantic competency directory in Output 3. The directory will be used to reference skills in open credentials and will link to the ESCO directory, which is the multilingual classification of European Skills, Competences, Qualifications and Occupations and is part of the Europe 2020 strategy. The technology behind the competency directory is based on the CASS framework. We also discussed learning group formation to be applied in the VM Learning Hub, especially to support group formation as part of the VM MOOC. We have had an interesting discussion about the criteria for learning group formation and group performance based on research and experiences of project partners. Fifth, we discussed the Virtual Mobility MOOC and OER. 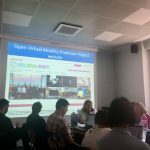 Università Roma Tre is developing the Virtual Mobility MOOC and OER in Output 6. We have discussed the current concept design including crowd creation of VM OER. Based on the typology of Salomon (2013): crowd wisdom, crowd creation, crowd funding, crowd voting, we decided our focus is on co-creation of content. We have discussed the form of the MOOC and using design tools such as the MOOC Canvas to refine the current concept. 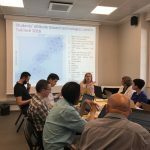 We have discussed the opportunity to involve external partners in defining the success criteria of the CM MOOC and OER as well as reusing existing OER such as OER created in other Erasmus+ project, e. g. OER on Open Badges from Open Badge Network. Finally, we discussed sustainability and dissemination of the project. 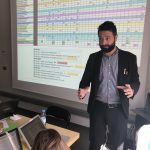 We are currently working on the strategic alignment of the dissemination plan and are aggregating the already numerous dissemination activities launched by project partners. We have also already started working on sustainability as it is an important aspect which cannot wait until the end of the project. We have collected some interesting ideas from partners and will validate them in the next step. Also, we have had good conversations and quality time together as a partnership. The importance of face to face meetings cannot be emphasised. Although we meet only every month with all partners and additionally in smaller working groups, including project management team, technology team and dissemination team, we all agree that face to face meeting with everyone are key for sharing common understanding and growing as a partnership. 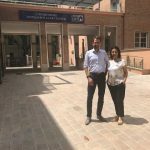 We look forward to the next meeting in September in Timisoara!